The Super Bowl finally came and went last night. Hate them or Love them, the Seattle Seahawks stood atop the ultimate stage for the whole world to admire. You may have noticed the many credentialed photographers in attendance, no less than a few hundred or more, fighting for prime position in hopes to capture that ever eluding perfect shot. In the next couple of days you will see some of the best shots from last night posted on ESPN, Sports Illustrated, USA Today, Getty Images, and numerous newspaper covers throughout the country. If you are like me, than you are already counting down the days to the NFL draft, Training Camp, Pre-Season, and the first game of the season. We have a long way to go for all of that, but for now I'd like to countdown my top 10 favorite football pictures that I shot this past season, you might be surprised by my #1 photo of the year. To me, good sportsmanship is something that needs to be taught at an early age, and the example always starts with the adults. I appreciate this picture because the adults kept it classy, and as you can see the kids followed in their example of sportsmanship. There is a story to why this is on my 1op 10 list. 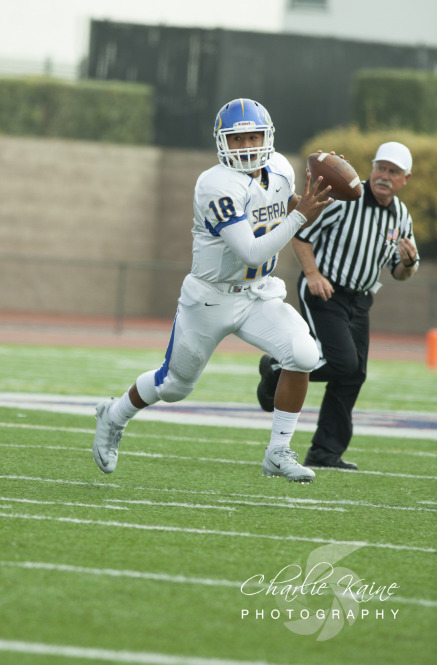 Weeks after I took this photo of Matthew Fa'aita, I was assigned to shoot another Serra game in the playoffs. As I arrived at the stadium, I saw an older man wearing a T-shirt with this picture on it. It was the grandfather of this player. I introduced myself to him as the photographer who captured the picture on his shirt. I felt so proud to have taken a photo that someone else was inspired to purchase and place on a t-shirt. One major difference between public school football and private Jesuit schools is the pre-game rituals. In public schools, the teams are lined up on their respective sidelines as they listen to the National Anthem being sung. When Jesuit schools play, the players line up in single file lines while on the field, maybe 20 feet from each other; a student will lead both teams in a prayer, then someone will sing The Star-Spangled Banner, then both teams will meet in the middle of the field to shake hands after raising up their helmets and shouting and cheering. This was a J/V game which featured this very impressive young man who ran through just about every undersized defensive player who got in his way. This was just one of his many big runs; you can see the determination in his eyes, and fear in the eyes of others. This game featured top prospect Morgan Mahalak from Marin, who has committed to going to Oregon next season to play quarterback. Anytime you can get the ball coming out of the quarterback's hand in a shot, you usually will end up with a great photo. Another Oregon Duck related photo. Zach Masoli, younger brother of former Oregon standout Jeremiah Masoli, ended his High School career by breaking just about every school record for passing. And of course, we have another ball in the air barely leaving the quarterback, one of my favorite shots. Football is a violent sport, which is why most teenage boys love to play it. So an elbow to the chin is just another day in the life of a football player. It's even better when you can capture the moment when it happens. This was an amazing catch by receiver Christian Hall. Not an easy catch by any means, but the receiver gave full effort and even with a hand in his face, stretched out to make this grab for a huge first down. I think it is obvious why this is one of my favorite photos from this season, but I'll explain anyway. Besides the fact that Ronzel Fox gave a monster stiff-arm to the defender to break free for a big run, I was his coach his Freshman year. He as a man child back then, and only got better over the years. I am proud to have been a small part of his success, and this picture is a great reminder of his dominance. As you can see, my absolute favorite football photo from 2013 is not an action shot. Sports photography doesn't always have to be someone in action, but it almost always has to show some sort of email of Cole March of Sacred Heart Prep embracing who I believe to be his mother. This shot was taken in the parking lot of the stadium after Cole's team just won the CIF CCS D4 Championship game. The hug lasted about 3 minutes, and you can just imagine the emotion that one would feel after winning a big game like this, and being able to enjoy that moment in time with his supportive mother. Of all the pictures I made this year, none of them convey a stronger emotion than what is conveyed between this mother and her son. To check out more of my sports photography, you can view all my galleries posted on Max Preps or my sports portfolio.